I made this card for the #3 Challenge as I need 2 baby cards to use with gifts. A piece of floral DP and Lace Border were cut from October Afternoon's Thrift Shop Paper Pad. I used the Martha Stewart Deco Fan Edger on the bottom of the lace paper and the Deco Fan Corner Punch on the corners of the DP. I also punched the border again using the blue card stock to accent the lace DP. Those were attached together, adding a piece of Lace from May Arts. Then I attached it to the blue cardstock. The Sweet Baby postcard is from Crafty Secrets Baby Girl Postcard Kit. I think it is the sweetest thing. I distressed it around the edges and for some reason the camera really accented the distressing in the picture. It is not near as dark IRL. I added some Webster Pages buttons and made a small flower out of the same lace used on the card. A Kaiser Pearl was added to the center. this is just adorable Joan..very sweet! 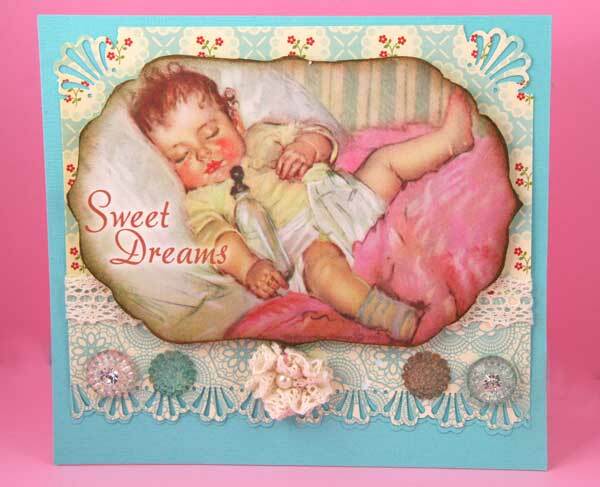 Your card is just precious, Joan....such a sweet image and I love the beautiful punched border!!! I am a little late to your challenges but will get myself in gear tomorrow!! !